We love to visit restaurants, markets, and food shops when we travel. One of our favorite places of business to explore is the world’s best bakeries. We’ve put together just a few of the sweet gems we’ve found over the years. As an extra treat some of our #FoodTravelChat moderators have also shared their personal favorites too. Take a read and be prepared to drool, just a little. Where else in the world can you find perfect croissants, pan au chocolat, and baguetttes that people are just munching right out in the street. Paris the city of light is also the city with some of the best pastries in the world. There are really too many bakeries to list here so we’ll just tell you about a few of our favorites. 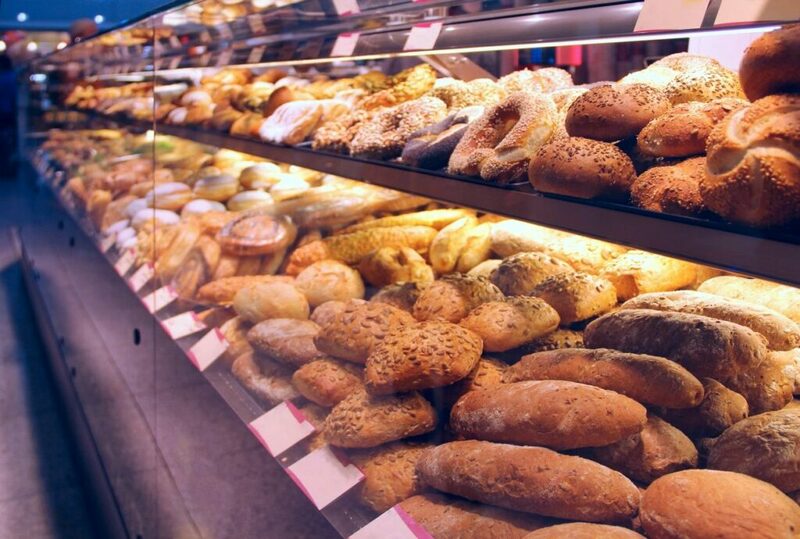 Bakeries bring instant memories for us. Gerard Mulot takes me immediately to an early morning ride on a high-speed TGV train from Paris to Epernay. On our way to the champagne region we had our little pink box from Gerard Mulot. How we waited to eat our apple tartin until under way I’ll never know. Everyone you talk to will have their own favorite. 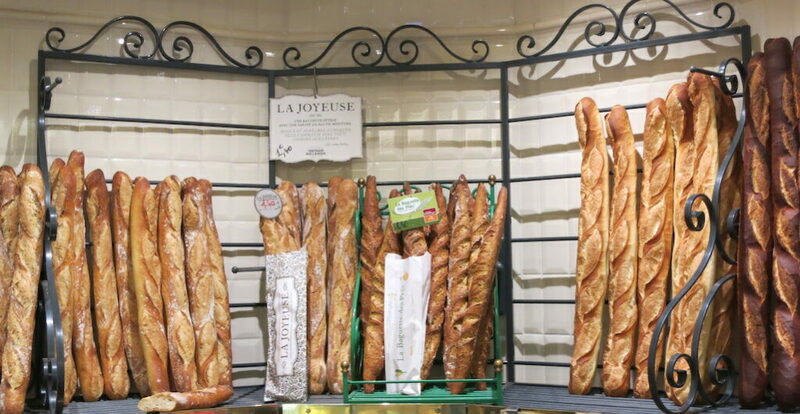 You’ll see people walking around Paris with baguettes sticking out of their bags, under their arms or just taking a bite out of them on the street. Do your own research and try as many as you can. Let us know which ones you like best. 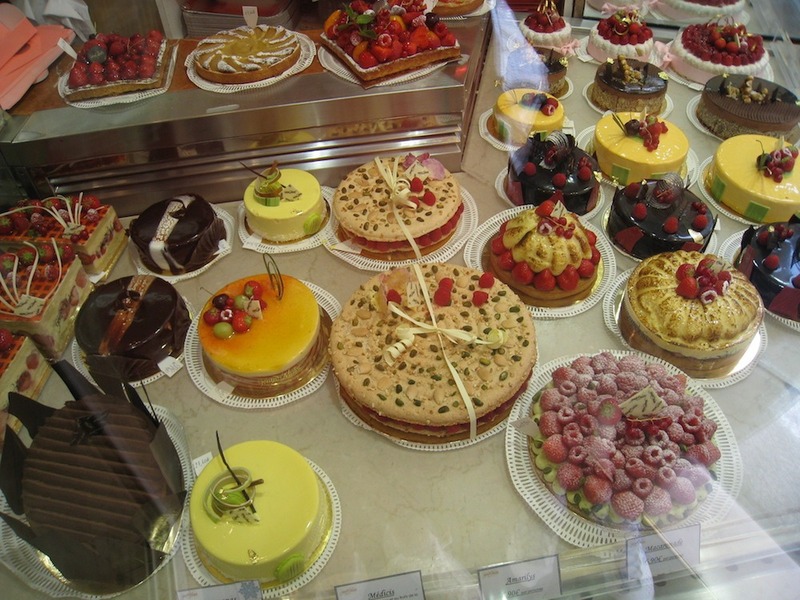 Stoherer might be known as being the first pastry shop in Paris and they have a bakery full of all the French goodies you will come to love including baguettes, cakes, macarons, tartins and even chocolates. Opened in 1730 by Nicolas Stohrer the pastry chef for Louis XV. This bustling place will take your breath away. Be sure to stay clear of the counters if you are not ready to buy just quite yet. The locals buzz in and out grabbing their favorites take a cue from them and just say I’ll have what she’s having. You simply can’t go to Portugal without tasting a pastel de nata or egg tart. There may be similar tarts other places around the world but the ones in Portugal are really special. You can find them in most of the bakeries and coffee shops throughout the country. 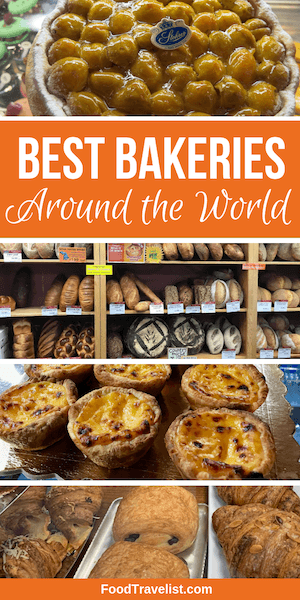 One particularly well known bakery is Pastelaria Alcoa. It’s right across the street from the Monastery of Alcobaca in Alcobaca. When you think of English cuisine you might immediately think of Yorkshire pudding, fish and chips and the like. But there’s such more much as we discovered on our tour of Northern England. 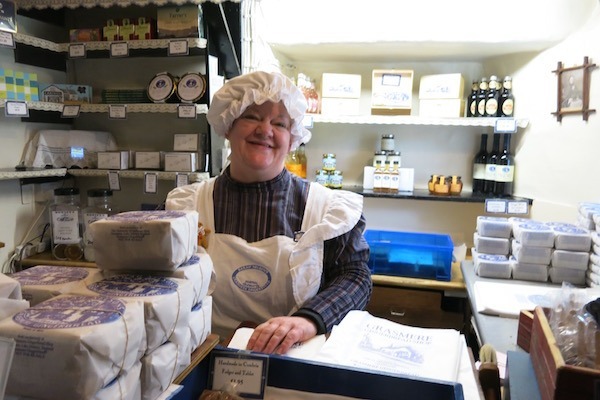 Located in Grasmere, Lake District, Cumbria, you’ll find a tiny shop producing a delicious and unique gingerbread. Sarah Nelson’s Gingerbread Shop may only hold a few customers but don’t let that stop you from waiting in line for your little package of gingerbread. Even the British royalty has made it to this special spot. We loved this crispy cookie that is just perfect with a cup of tea so much that we brought back several packages. Safely secured in the freezer I would take out one piece to have as a special treat with my tea. I finally ate the last one a few months ago. No worries! They ship this tasty cookie around the world. 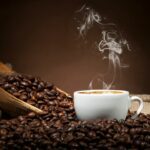 Greece is another country that loves it’s coffee shops. In fact, you could say that spending hours sipping coffee and debating every thing under the sun is a Greek national pastime. When in Greece you must try the loukoumades. Small fried dough drenched in honey. Sound tempting? They sure are. 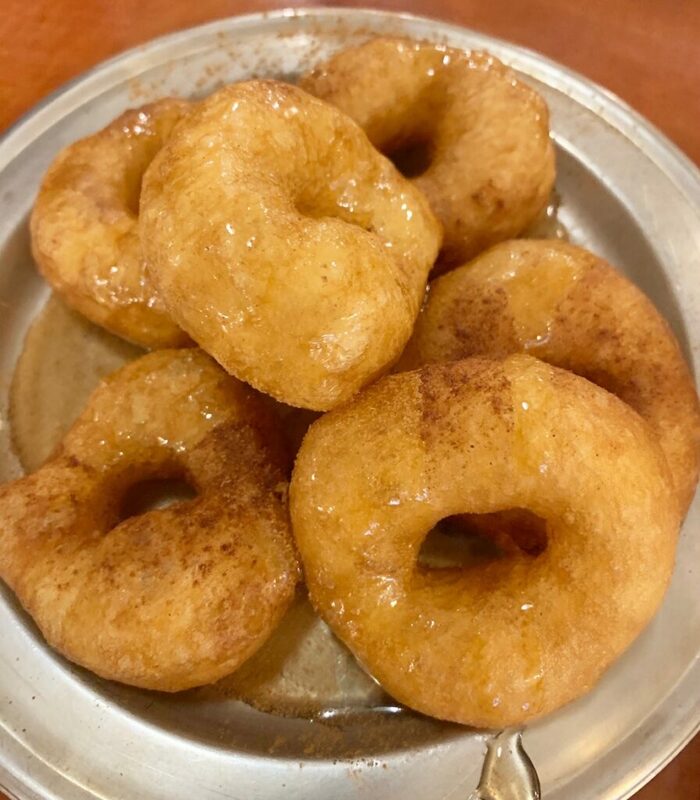 One of the oldest loukoumades shops is Krinos. 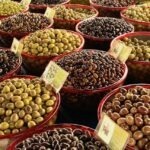 After doing some shopping and walking around Athens reward yourself with a plate of these sweet treats. Served with ice water on a cafeteria tray. It’s not fancy but it’s delicious. Favorite of Cynthia from Adventuring Woman. 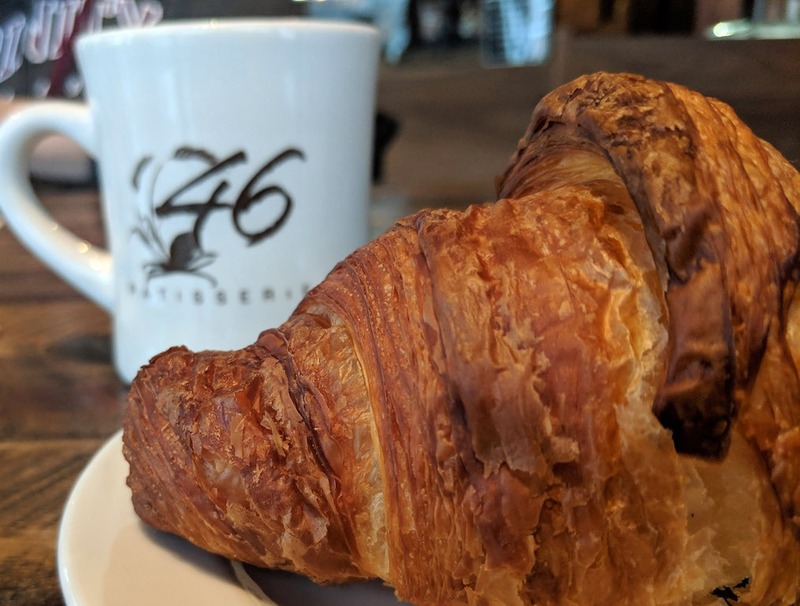 This popular Minneapolis patisserie, helmed by French-trained pastry chef John Kraus, is one of my favorite bakeries in Minneapolis. It’s a neighborhood place, a cozy spot to meet friends or spend some quality alone time with your pastry. They offer coffee and some savories, but I come here to indulge in something decadent. Patisserie 46 changes things up frequently, their display case with its spotless glass shifting shades from rose to gold and back again. They always have the best croissants in town and a selection of exquisitely crafted pastries. These miniature works of art typically include cake, a couple of tarts, and something with choux. On the homey side, coffee cake, banana bread, and big cookies appear regularly. A daily special feature eliminates boredom (though I can’t imagine that). At my last visit it was a Danish, a shiny pink sphere of guava nestled inside it. As if it weren’t enough to be a renowned pastry chef, Kraus also is an accomplished chocolatier. The gorgeous chocolates on display were captivating. I understand from their website they make paté de fruits, which had me in raptures; I haven’t had the pleasure of eating one since I was in Paris last. Looks like you have to order a minimum of 50, so I’m out of luck there. Until I can find someone to join me in a paté de fruits feast, that is. The croissants, and I made a point of trying the plain for a change, shatter in your mouth and are light as a feather. The friend with me said it was the best croissant she’d ever had in her LIFE. Now that’s an homage. I’ve recently become addicted to French style macarons. I always knew they are the perfect sweet bite. But my expectations completely changed the day I walked into LB Bakery at Lord Baltimore Hotel and saw the macarons displayed in the counter. First, they were HUGE! Beautifully decorated in gorgeous colors, they are crispy and chewy on the outside and velvety on the inside. While the cookie is airy and sweet, the filling is flavored perfectly. Hands down, they are the best macarons I’ve ever had. 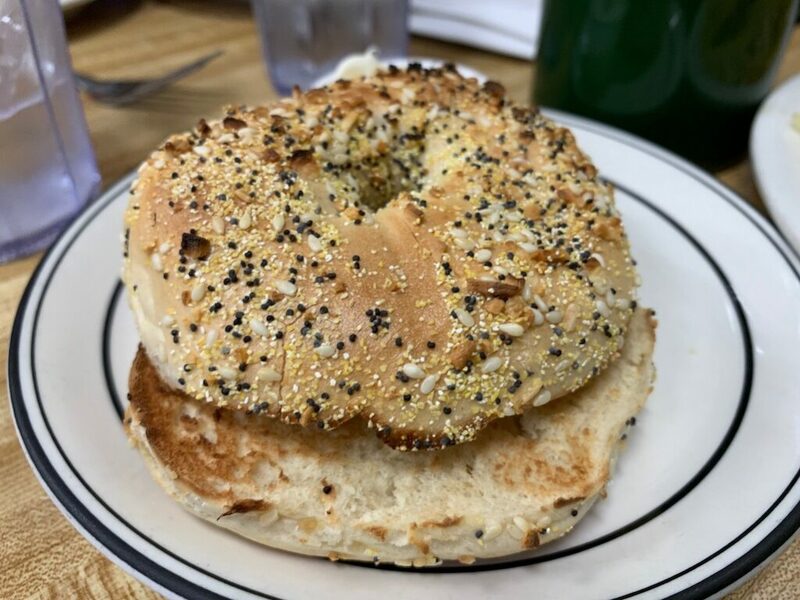 Whether you are staying at the glamourous Lord Baltimore Hotel or driving through Baltimore, a stop to experience anything at the LB Bakery is a treat. 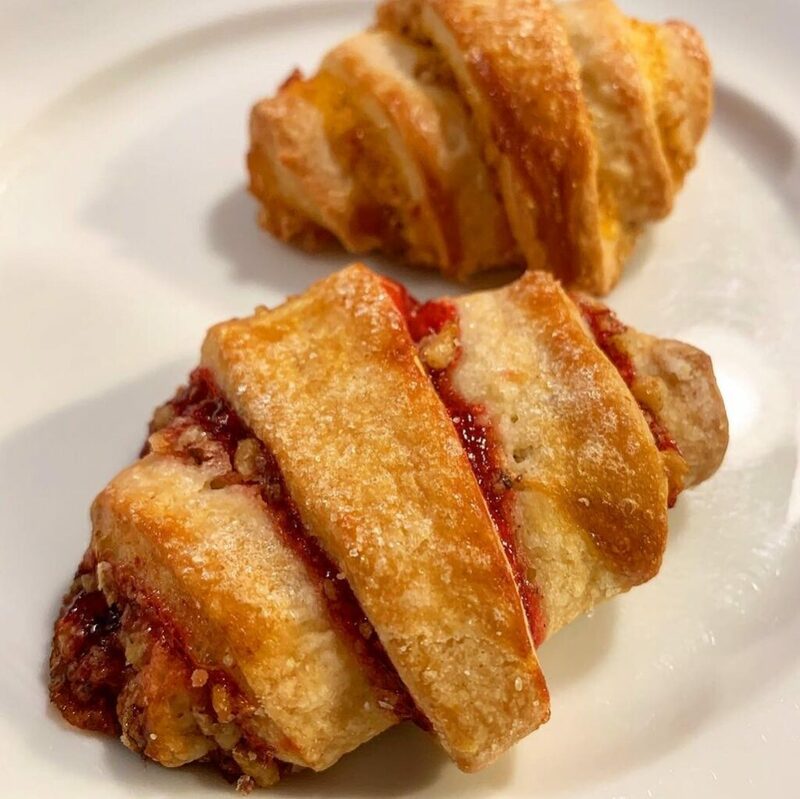 From their delicious breakfasts (think hot quiche and flaky croissants) to decadent desserts, everything is made fresh and with great expertise from Executive Pastry Chef Mary Plovanich. She offers a new surprise every time I visit depending on the season. The LB Bakery has a great vibe and there are many tables to relax there or you can carry-out to enjoy at home. Or do both, like I do! For me, I can never visit my favorite LB Bakery without leaving with at least one macaron. 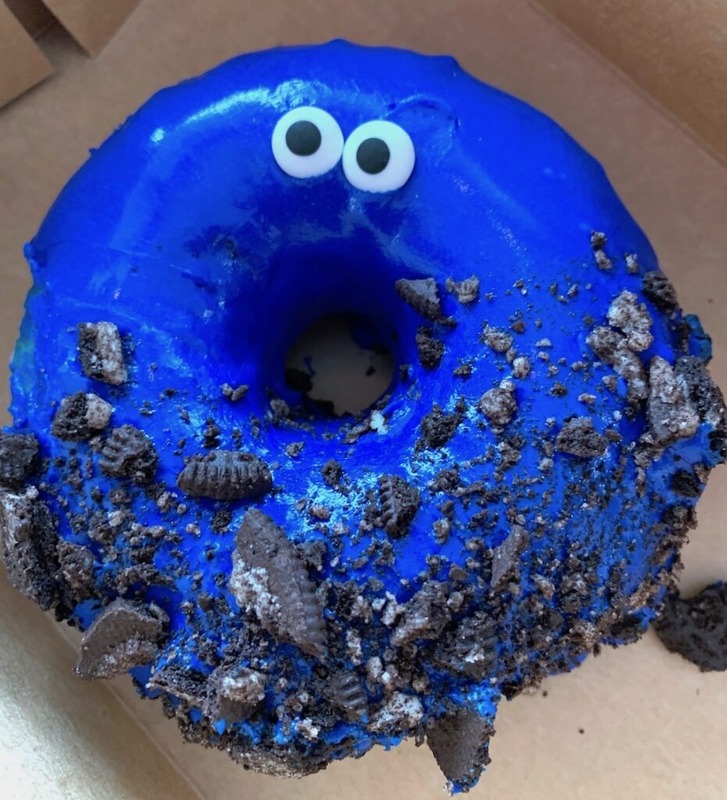 Dominique Ansel shot to fame when he debuted the now-famous cronut, but his bakery has so much more to offer than cronuts. 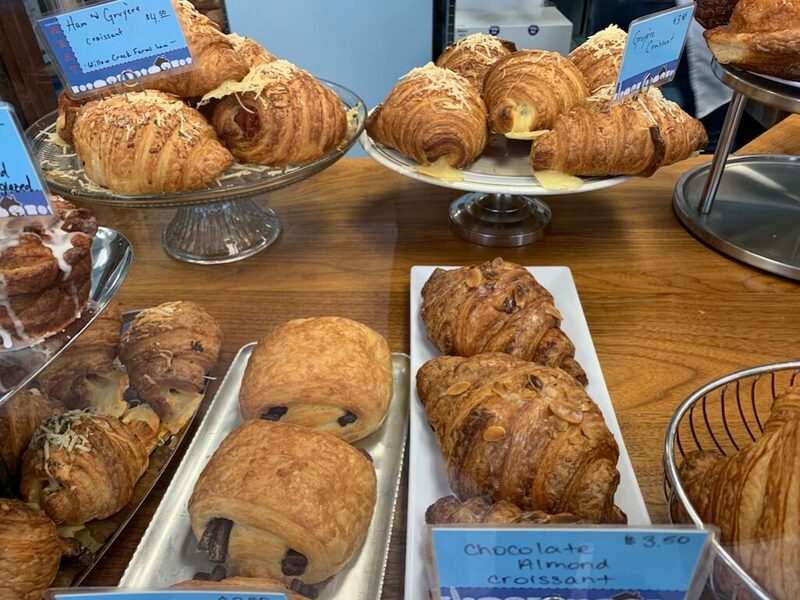 From classic French baked good from croissants to toasted s’more bites, every offering is beautiful and delicious. But what made me really fall in love, was a special “dessert only” pop up Chef Ansel created that I attended. “Up – A Series of Firsts”, was a collection of baked goods and other sweet offerings with the theme of important life “firsts” – milestones such as your first words, first kiss, heartbreak, job, and more. It was so detailed and personalized, that our first course, our first words, were actually our very first words that we uttered and told the staff in advance. 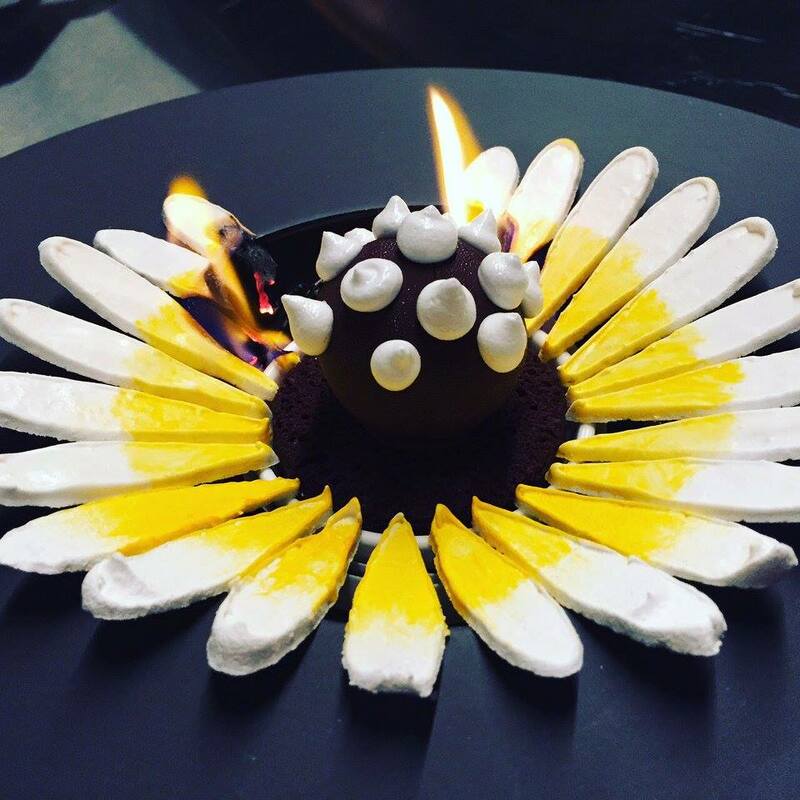 My favorite course was the First Heartbreak, while bittersweet, this beautiful Baked Alaska was “set on fire” upon serving. It was both dramatic and delicious. The intimate night was incredibly special and ever since I’ve made it a point to stop into his bakery every time I’m in New York City. There isn’t a single items that isn’t tasty and baked with both precision, care and love. If you want an old school Italian bakery that excels in holiday specialties, cannoli and gourmet pastries, then go to Isgro’s Bakery on Christian Street near the Italian Market in Philly. The place is packed on Saturdays and right before holidays with a friendly crowd, so grab a number to get waited on. When you walk in the door, you can just drink in the sights and smells. 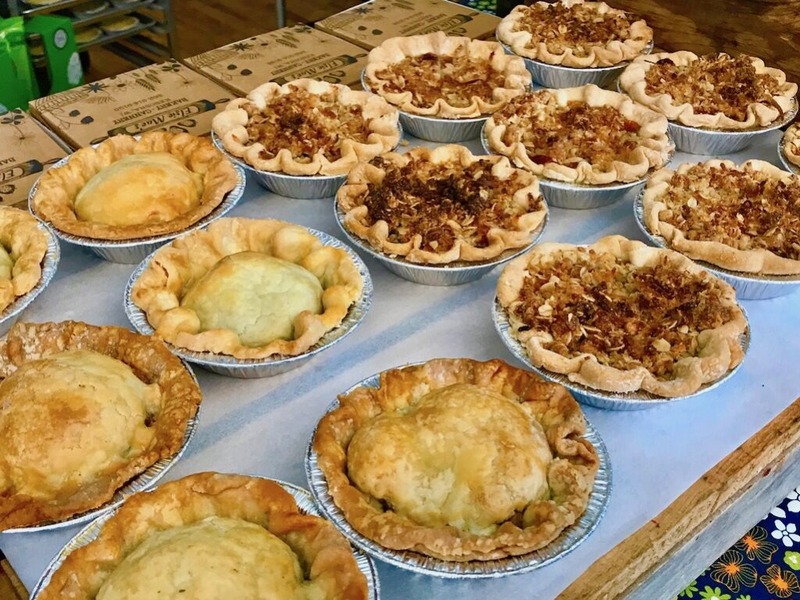 Isgro’s Bakery’s award winning pastries have won “Best of Philly” four times. Every holiday is different. For St. Joseph’s Day there are zeppoli filled with ricotta. 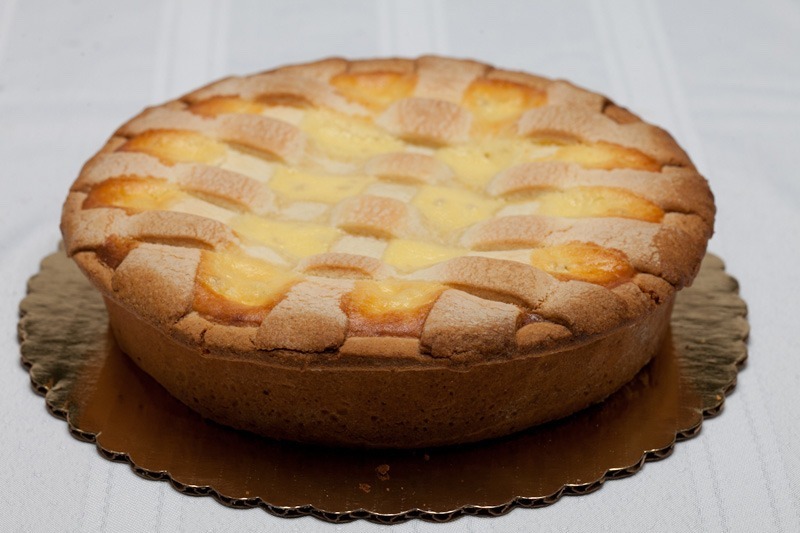 For Easter the cases are filled with lamb cakes, tiny egg cakes, cakes shaped like Easter baskets, colorful breads with eggs baked inside, traditional Sicilian ham pies, and my favorite, the ricotta pies. Before Christmas the lines go out the door and down the street. The shelves are filled with festive trays of delicate Italian cookies, homemade torrone nougat candy, Buche de Noel logs, and Christmas cakes that become the centerpieces of tables throughout Philadelphia. 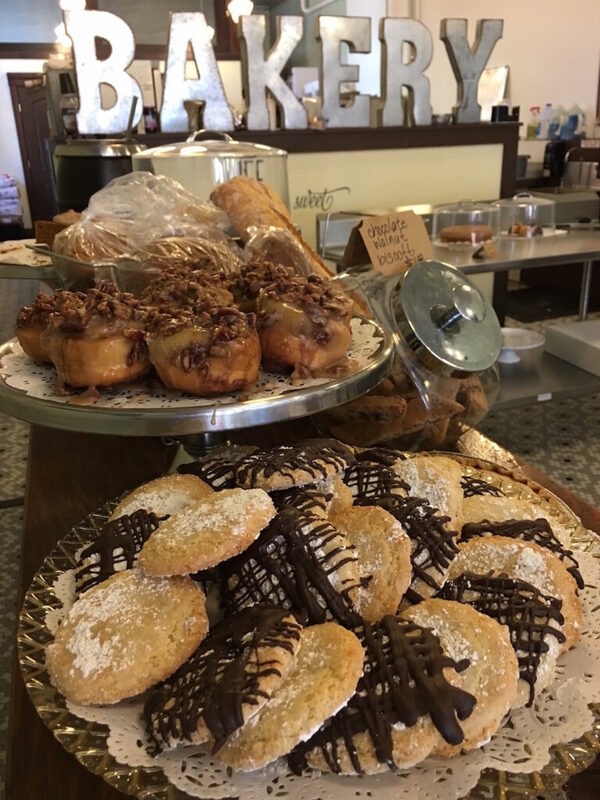 For over 100 years, Isgro’s has been famous for their cannolis, filled to order with your choice of ricotta, vanilla, chocolate, mascarpone or chocolate mousse. Their pastries are tiny works of art, composed of fresh fruits and glazes, flaky crusts, artisanal chocolates, fluffy mousse and cheesecake. My favorite pastries are the delicate chocolate tea cups filled with mousse and presented on tiny golden plates. If you can’t make it to Philly, you can order tins of biscotti, cookies and torrone online. Every single time we return to Los Angeles we have to stop in at Bea’s. We have to take home their corn rye, bagels, rugelah and amazing butter cookies. Frankly, we want to take home everything but we’d need an entire suitcase. Our dream is that one day they will ship their products to us in Wisconsin. If you visit, stop in Mort’s Deli next store for the best breakfast and lunch in town. 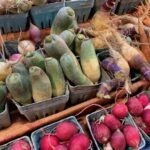 Roseville may be the gateway to Minneapolis and St. Paul Minnesota but it has plenty of food merits all its own. One of them is The Grateful Table. The mother and daughter team and producing top quality pastries made from the best ingredients. 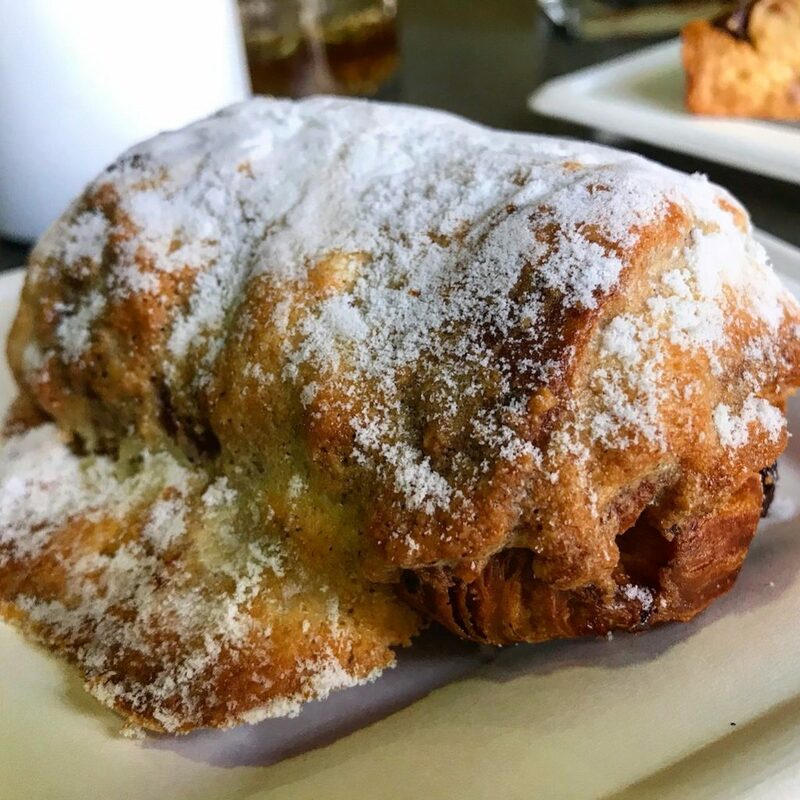 Don’t miss the chocolate almond croissant. Talk about small but mighty. This town of just over 1,600 has some darn good culinary delights. 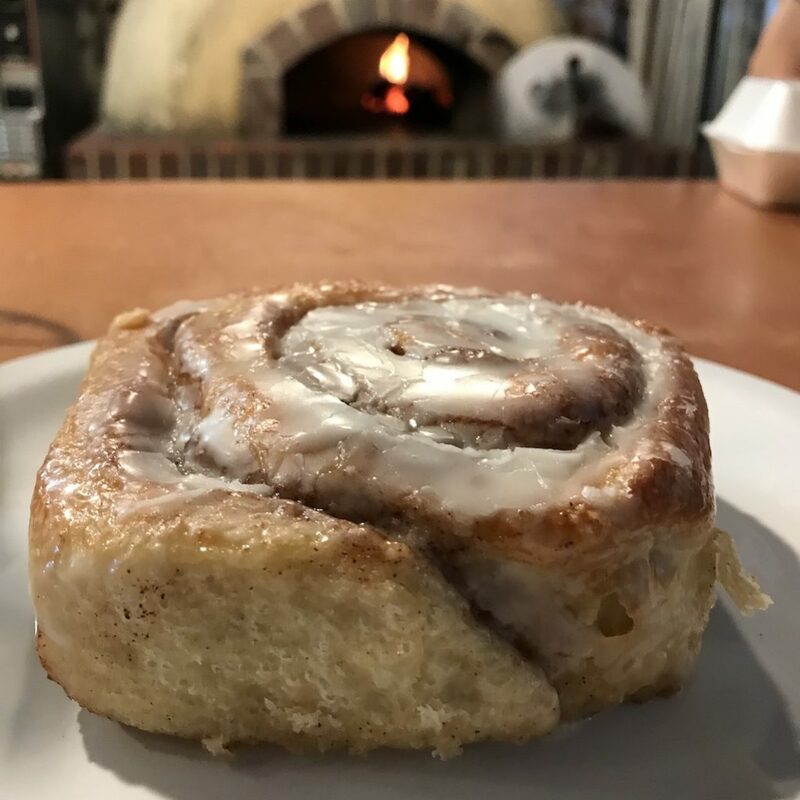 On your way to Yellowstone pick up some of their giant cinnamon rolls and their handmade sandwiches. Your picnic will be the envy of all the other visitors. You want locally prepared food with local ingredients? Of course you do. Chef Kim at Mountain Mama Cafe is making pot pits with elk, bison, pheasant, trout, chicken and beef! But our favorite is the huckleberry turnovers straight out of the oven. She’s got a small shop just outside Yellowstone but her cooking is some of the best you’ll ever experience. If you go to Ann Arbor you can’t miss Zingerman’s they are everywhere. 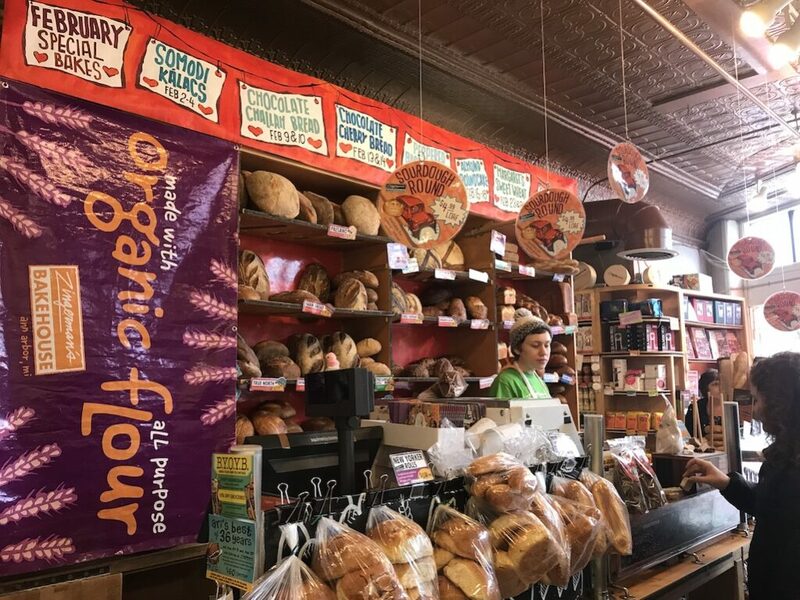 But if you’re a bakery lover you won’t want to miss Zingerman’s Bakehouse. Some of the best bread you’ll ever have is there from delicious rye, sourdough and the very unique chocolate cherry bread. I lived in Chicago for most of my 50+ years so I know there are a ton of great bakeries. Here are just a few that you can’t miss if you are visiting the Windy City. This one is a sentimental favorite. Located a few blocks from my Grandma’s house I loved walking their with her. Just the anticipation of going to this small bakery with shelves filled with my favorite treats like chocolate chip sweet rolls, chocolate covered cake donuts, butter cookies and bacon rolls. Yes, rolls stuffed with bacon! This old bakery is a south side icon. Get there early they open at 5am and the goodies start flying off the shelves. Chicago has a huge population of Polish immigrants so there are a ton of Polish bakeries. Known for their paczki the Polish jelly pastry eaten primarily on Fat Tuesday Delightful Pastries makes more than anyone else in town. Over 30,000 during the few days right before the beginning of Lent. 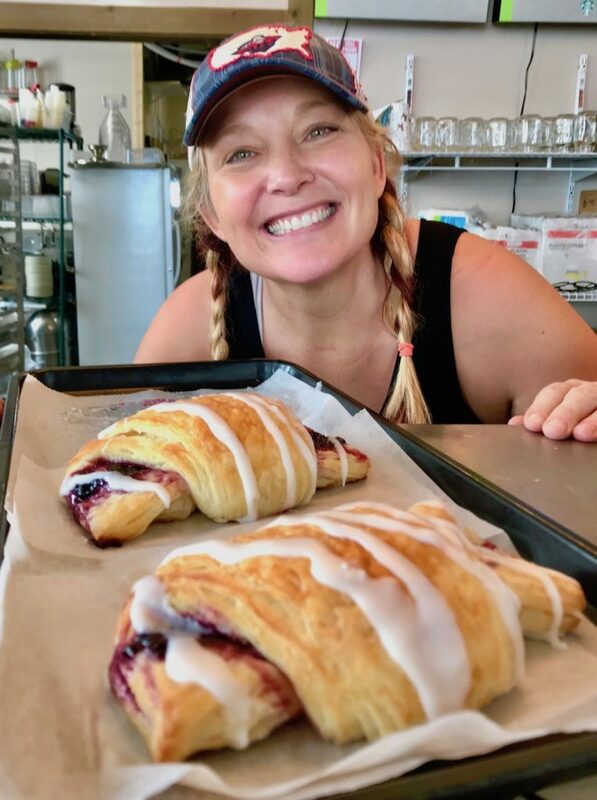 Executive Pastry Chef (and our good friend) Dobra Bielinski and her mom Stacia Hawryszczuk produce those and many other Polish specialties as well as breads, croissants and seasonal butter cookies and much more. Our old neighborhood has this bakery that was formerly a German bakery. Thankfully they kept many of the recipes. 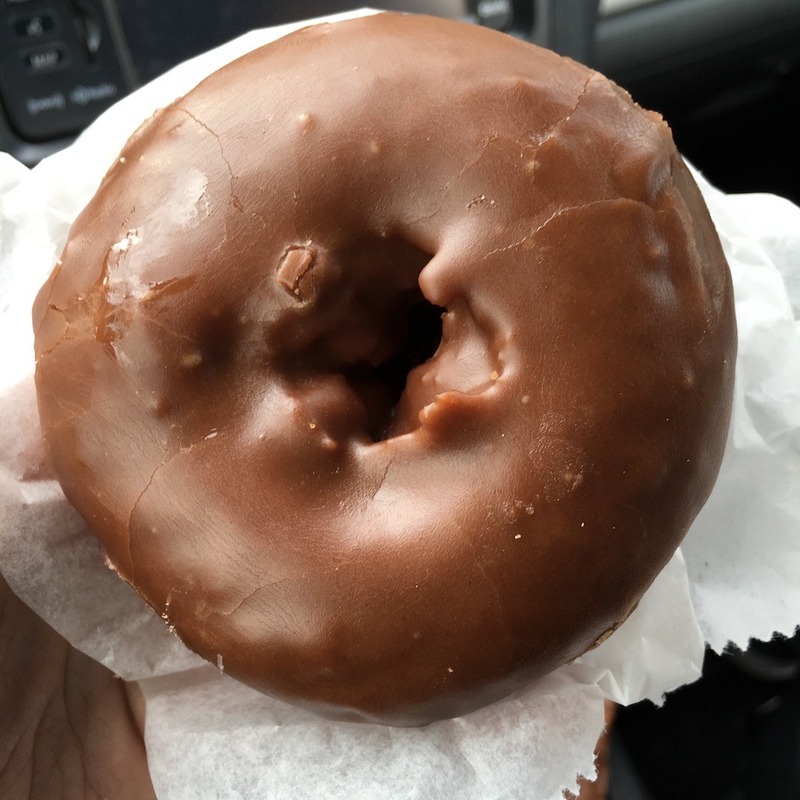 Around for over 80 years this local favorite has wonderful chocolate covered donuts, coffee cakes, sweet rolls with real fruit filling, lots of bread, cakes, and tasty butter cookies. Fresh made paczki at Delightful Pastries. If you live in the Midwest, we hope you take a lot of road trips because there are so many beautiful places to explore. One of those spots is Starved Rock. On your way be sure to stop in at the Ottawa Bakery in nearby Ottawa. We can still remember the almond cookies we munched on. We also picked up the bakers flat bread dough that we sampled at a near by restaurant that was outstanding. Wisconsin may be the Dairyland but we have no shortage of bakeries. We’re just getting started on our explorations but here are a few to tempt you to visit Wisconsin sooner than later. This can best be described as our new neighborhood bakery. 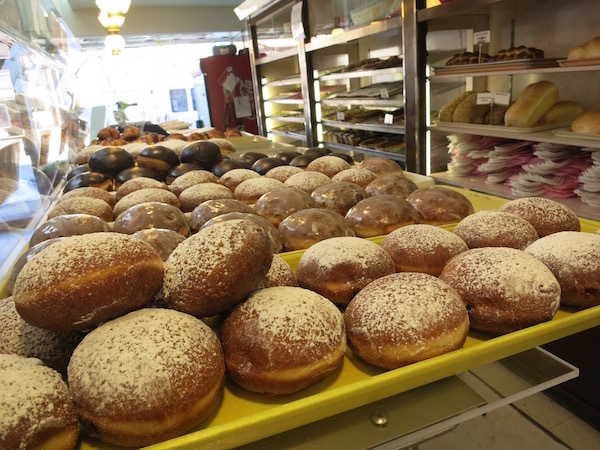 It’s the closest one that has Russian and European bakers producing some of our favorites – even a paczki on Fat Tuesday! We love their cookies, breads and sweet rolls. They have a cute cafe too that’s great for breakfast and lunch. We love a good croissant and baguette and Batch has them. If you want something on the more savory side I highly recommend the gruyere and ham croissant. Tres magnifique! These guys really make some fun donuts and the largest bear claw we’ve ever seen. I had to pick up the Elmo donut for my Elmo loving niece. This bakery in Kenosha is one of our faves. Elsie Mae’s buttery crust makes each and every one better than the next. Their cookies make an excellent ice cream sandwich or taco as they call it, which you can get their too. Who’s craving a bakery right now? I know I am. 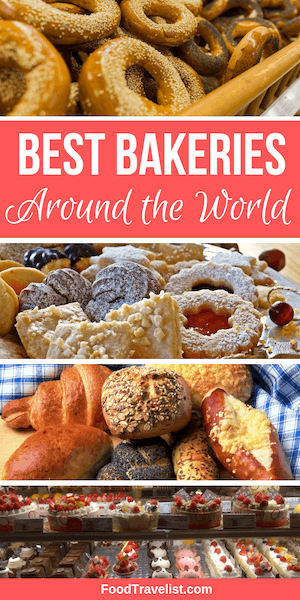 Let us know if you’ve been to any of these bakeries or if you have one you want us to visit in the comments below. And I was going to eat so healthy this morning. Out goes the yogurt and fruit. Now I want to visit a bakery! 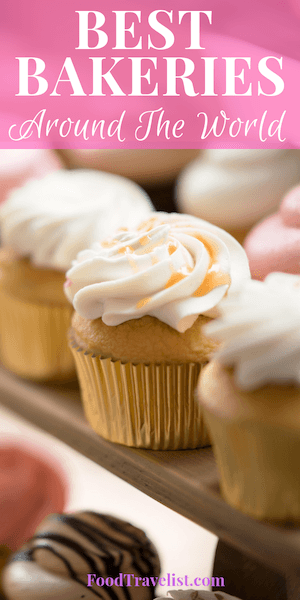 Have you ever tried Lovin Oven Cakery? Their biggest store is in Antioch IL, but they also have their original store in Round Lake Beach IL and one in Libertyville, IL. Their display cases are gorgeous. Bakery treats can be quite tempting that’s for sure. Thanks for recommendations of Lovin Oven Cakery we’ll definitely check it out on one of our road trips. OMG! These bakeries sound so wonderful. There goes my gluten-free diet! My biggest weakness is a good baguette in Paris or the USA and a fruit tart. I love any kind of baked good with fruit. Ih my, what a delicious trip around the world that was. I always try to seek out a local bakery when I travel so thank you for pointing me in the right direction. A couple of these are close to home too. Looks like I’ll be heading to Baltimore soon for a trip to LD Bakery. Yum! Good cinnamon rolls are my weakness. Oh and chocolate croissants. Now I’ve lost my concentration. Big Timber bakery is calling my name! It’s certainly got a lot of big taste for a little town in Montana. Hope you make it there some day. Their sandwiches are equally delicious and very splitable. There is indeed nothing like a great bakery, especially to select something to go with your coffee in the morning. 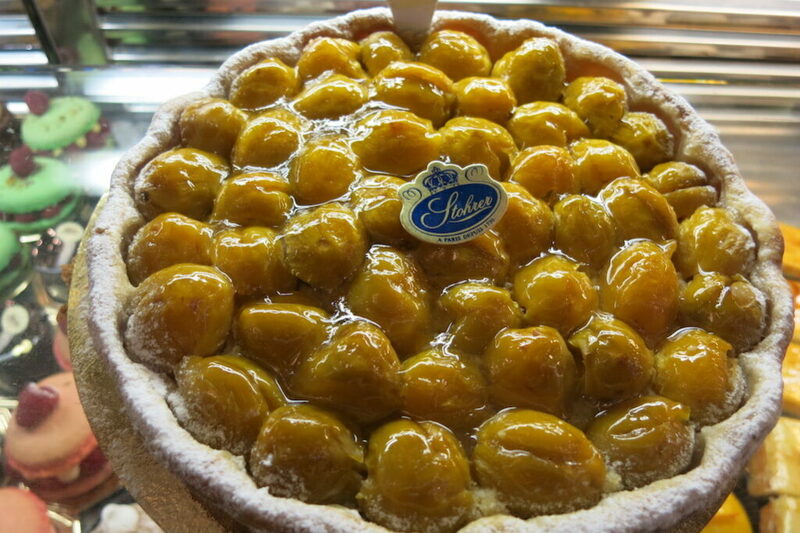 I would like to try that Stoherer tart–am wondering what it is topped with, perhaps small pears? Hi Carole! Thanks for stopping by. They are little creme puffs I believe. Everything in there was decadent. Do you want to read something really sad? 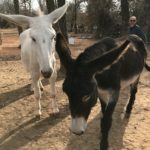 I am eating carrots while reading your post about great bakeries. 2 more pounds to go after our trip to Hawaii. Maui Pie was the killer. You can add it to your great bakeries’ list if you ever visit Kihei. You’ve got my attention Suzanne. Maui Pie? That sounds very interesting. We’ll be sure to check out it. Everything in moderation, right? Total YUMMM. Here I am before lunch tome reading this post and craving each and every one of those amazing pastries! As you know, I generally seek out chocolate shops when I travel, but so often they are combined with bake shops and patisseries, so I’m all in when it comes to baked goods. That is a risk you take is you read one of our posts while you’re hungry. So many bakeries make chocolates too, win, win, I’d say. Yes, it made me hungry. It also made me remember Laduree on Champs Elysees. where the French macaron was born and where lines are long every day to buy some of it to eat or take home! Hi Carol! Laduree is a Paris stable that’s for sure. 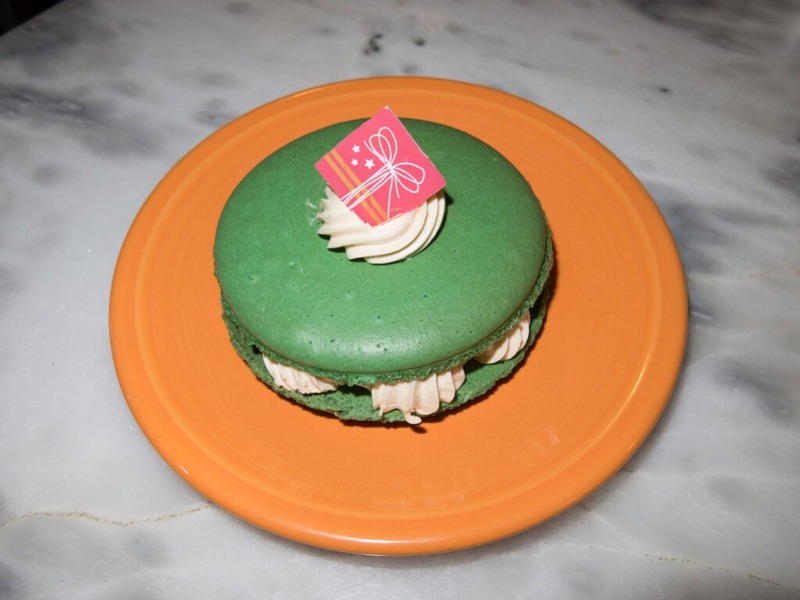 They do have tasty macarons and it’s a great place to stop for lunch too.